The photo is simple: a steel mobile home with the door cracked open. A woman stands in the door frame, the golden hues of the sun highlighting the profile of her face. A yellow-blue tint glazes the frame, a natural filter for the earthy scene. 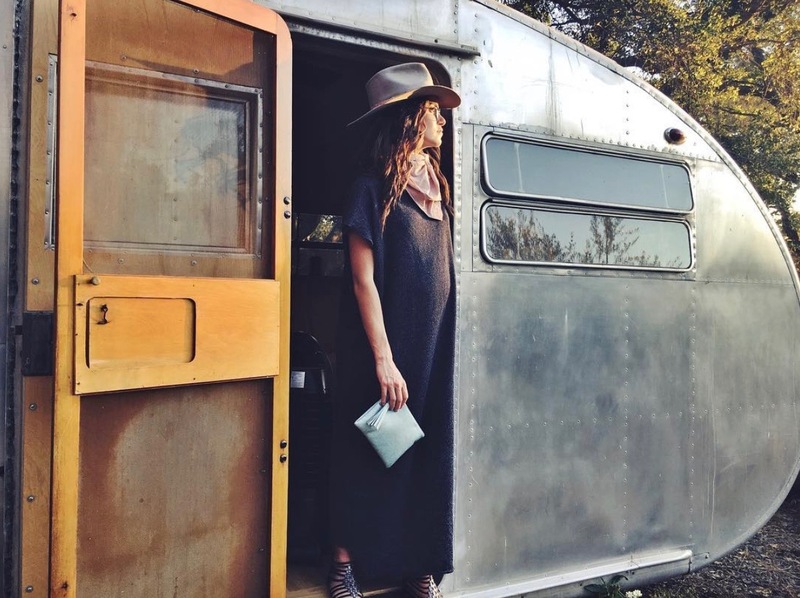 The caption for the image on Instagram would read something like, “I am a Woman with a Floppy Hat^TM and I am the epitome of ‘crunchy.’” Only, the star of the photo is actress Nikki Reed of “Twilight” fame. Her net worth is estimated to be 16 million dollars. This the photo shoot to promote her new sustainable fashion brand, Bayou with Love. The American desire for fashion is like the American desire for everything else: we want it now, we want it fast, we want it cheap. But most importantly, we want it consequence free. When there are consequences, we express our Americanness in the best way we know how: we pretend they don’t exist. A combination of these things has led to what is called “fast fashion,” a production model that depends on the consumers’ desire for cheap clothes that can be thrown out guilt free. This, of course, makes room for more cheap clothing that comes at a much higher cost than we think. Sustainable fashion, on the contrary, is concerned with consequence. The sustainable fashion industry seeks to create a system of clothing production that is conscious of its environmental and social impact. A conscious consumer is interested in what chemicals are sprayed on the textile seeds, how the textiles get from farm to factory, who makes our clothes, and where the products and its byproducts actually end up, thinking about, for example, that seven-dollar t-shirt from The Gap, and the chemical waste being dumped into bodies of water as a result. Sustainability thus comes with transparency, and transparency leads to accountability. Someone is responsible for making the decision to dispose of toxic waste into foreign rivers. Someone is responsible for choosing chlorinated anilines, many of which are known carcinogens, in the textile dye. Someone is responsible for the 117 Bangladeshi women killed in a factory fire. A common sustainable practice in fashion is the use of environmentally preferred alternative fibers for textile production. In Reed’s collection, Bayou with Love, for example, she lists cupro, recycled cotton canvas, tencel, post-consumer plastic, low chemical content chambrays and dying techniques, and organic cotton as alternative materials used in her products. This can make a huge difference. Nearly 40 percent of all textiles are made of cotton and, as a product, cotton requires the most pesticide use globally. This is largely because cotton fields are now treated like factories. Consumers want clothes and they want clothes quickly. They do not care about which seasons cotton can grow in. In order to produce the quantity of cotton needed to satisfy the demand, farmers have resorted to the use of aerial pesticides instead of spot treatment as well as the use of a genetically modified cotton seed, ensuring it can always grow. These things, when combined, lower the price of cotton while damaging the land and produce a cotton ridden with chemicals. Organic cotton prohibits the use of toxic and persistent synthetic pesticides and fertilizers, as well as genetically modified seeds. To be sold as organic, the cotton must be certified by a third party. These certification procedures lead to additional costs but ensure the integrity of organic standards. Denim brand Kings of Indigo uses organic cotton as well as other sustainable textiles in their jeans. But this comes at a price, literally. A pair of jeans from KOI costs around 173 dollars. You can get a similar pair of jeans for 20 dollars at H&M. The problem with the image of Reed, the millionaire actress standing sun-kissed next to a mobile home, is that it attempts to visually conflate eco-consciousness and affordability. “Sustainability” is marketed as something reserved for people with alternative lifestyles—people with earthy leanings and ripped clothing. But sustainable fashion should really be marketed to the people wearing Lululemon leggings or carrying their Louis Vuitton bags. The burden of sustainability lies with the population who can afford it. There is a distortion of transparency within the system that advertises that only people living in mobile homes buy sustainable clothes. Conscious consumption is too often a privilege, one that many people do not have. Those H&M jeans come at a price much higher than the number listed on the tag. Those 20 dollars do not include the cost of the piece of land being irreparably exploited for human gain, or the cost of the animals slaughtered from ingesting pesticides, or the cost of a woman’s safety in Bangladesh who sewed the seam of those pants.